Corn seedlings that grow close together give off underground signals that impact the growth of nearby plants, reports a study published May 2, 2018 in the open-access journal PLOS ONE by Velemir Ninkovic from the Swedish University of Agricultural Sciences, Sweden, and colleagues. Plants have developed complex, chemical systems of communication to compensate for their immobile lifestyle. Many of their messages take the form of chemicals secreted by roots into the soil, which are detected through the roots of nearby plants. These secretions tell plants whether their neighbors are relatives or strangers and help them direct their growth accordingly. 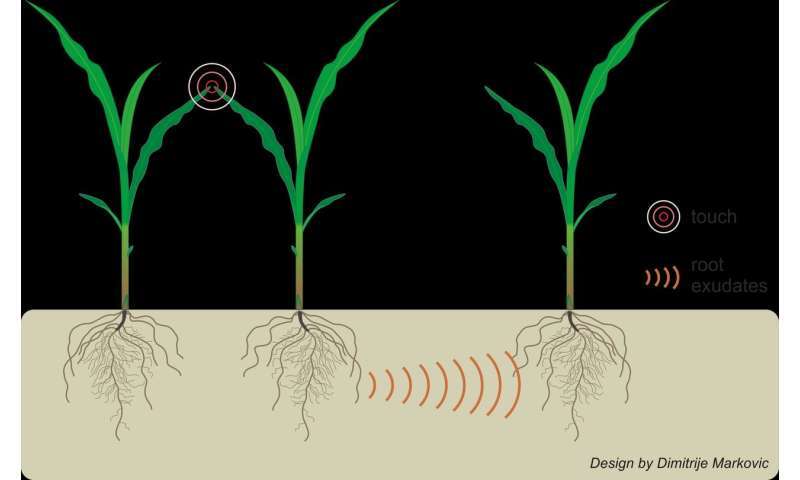 To better understand how aboveground interactions affect this underground communication system, the authors of the present study stressed corn seedlings and then looked for growth changes in nearby siblings. They brushed the corn leaves to simulate the touch of a nearby plant leaf and then collected the chemicals secreted by the roots in the seedling's growth solution. New plants transferred into that growth solution responded by directing their resources into growing more leaves and fewer roots than control plants. The authors also tested newly germinated corn seedlings to see if they could detect differences in growth solutions from plants that had been touched and those that had not been disturbed. The seedling's primary root grew preferentially toward solutions from untouched plants, suggesting that it could differentiate between the two solutions. The researchers demonstrated that even brief disturbances aboveground can lead to changes in underground communication that cause nearby plants to change their growth strategies. They note that researchers should take into account the extent to which they touch plants during an experiment, such as occurs while taking measurements, as the effects on touched plants and their neighbors have the potential to impact experimental results. Lead author Velemir Ninkovic says: "Our study demonstrated that changes induced by above ground mechanical contact between plants can affect below ground interactions, acting as cues in prediction of the future competitors." Can a plant be altruistic?